The paint used on these barn stars creates a rugged hammered look! These metallic hammered metal stars are very sturdy and durable. A hammered finish on metal stars add a new look to your home and garden decor. These stars have a bold character that will enhance your home and garden decor. Stars are measured from left to right tip to tip. The stars are handmade therefore all measurements are very close and approximate. The thickness of the steel is 22 gauge (thickness of a dime). These are not flimsy stars. Below are the color samples of our metallic colors and sizes from 10" to 10'. 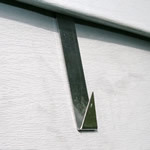 Make sure you click on the close up pictures below to a good view of the hammered effect. Metallic hammered metal stars will keep up with the changing times and add a new finish to your metal stars decor. These metallic hammered metal stars are very sturdy and durable. They are made from 22 gauge galvanized metal and guaranteed not to rust! These 32" metallic hammered barn stars have a bold character that will enhance your home and garden decor. Metallic hammered metal stars are designed to add unique appeal to your home and garden decor. These metallic hammered large metal stars will be a beautiful addition to your home or barn. You simply won't find a more beautiful large barn star anywhere. 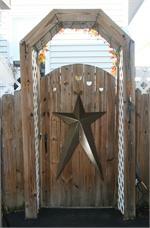 These metallic large metal stars are very sturdy and durable. They are made from 22 gauge galvanized metal and guaranteed not to rust! It's metallic hammer time! If your looking for quality metallic and unique long barn stars for sale they are here and you can buy yours today! Long metallic hammered barn stars are a spectacular way to add a touch of uniqness to your home and garden decor. Display these unique metallic hammered long metal stars for all your guests to see and let them be in awe of your creative home decor.